An excellent 1855 first edition example of Colton's map of Philadelphia, Pennsylvania. This city plan covers Philadelphia from the Schuylkill River in the northwest to the Delaware River in the southwest, and from Somerset Street to Mt. Keon Street, along with parts of adjacent Camden. Identifies the Navy Yard, the Country Prison, Girard College, the Reading Railroad, the Alms House, Fairmont Waterworks, and the Odd Fellows Cemetery. 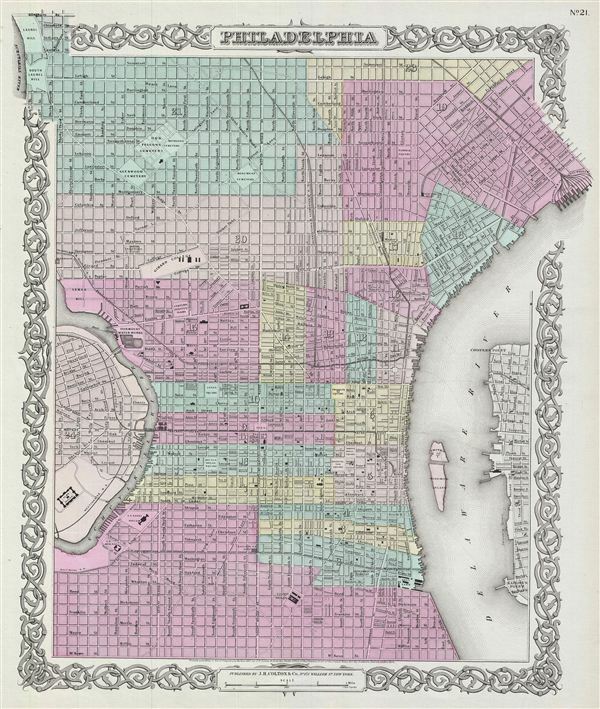 Map is hand colored in pink, green, yellow, and blue pastels according to Philadelphia's 24 city wards, and offers wonderful detail at the street level including references to the important buildings, cemeteries, roads, railroads and squares. Surrounded by Colton's typical spiral motif border. Dated and copyrighted to J. H. Colton, 1855. Published from Colton's 172 William Street Office in New York City. Issued as page no. 21 in volume 1 of Colton's 1856 Atlas of the World. Rumsey 0149.027 (1856 edition). Phillips (Atlases) 816.